Schoex is one of the best industry school management system which comes with best attendance management feature, all you have to do is just set a bio-metric machine at the gate of school and relax, schoex is fully integrated with bio-metric machines and attendance for students and staff can be get from bio-metric machine. Although it is a necessary task, entering attendance records manually into your computer software for every student can be very time consuming and tedious. However, when you choose school attendance software like Schoex, you can achieve the same thing in just a fraction of the time. By default, Schoex considers all of the students that are currently enrolled in your school or college. You just need to add in the number of late arrivals and absences, and the rest is taken care of for you by the attendance management system. 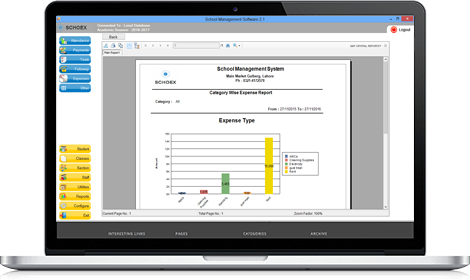 Schoex provides several attendance management reports that can be used for providing you all of the attendance reports and records or either an entire class or single student, depending on what your preference is. Our Shoex Attendance Management generates these reports and provides you with attendance history for every student that is unlimited. This allows you to easily and quickly access important information when you need it. Send sms to the parents of absent students by single click, so that they can keep informed about their child. There are near about hundred of reports about attendance of staff and students so you can analyse the data properly in less time and less effort. School Management system is fully integrated with bio-metric machine, and attendance for staff and students can be get from bio-metric machine. By default, Schoex considers all of the students present. You just need to add in the number of absences, and the rest is taken care of for you by the attendance management system.